Long after most of the city is in bed, a separate culture emerges in Memphis. They move silently, leaving only the faint echoing of a rattling steel can and the smell of aerosol hanging in the night air. They move without a trace until the morning light reveals their work -- a hastily drawn signature, a caricature or an elaborate mural. Graffiti culture traces its roots to the Bronx, N.Y., where the medium began gaining mainstream popularity in the 1980s alongside hip-hop culture, becoming a popular form of expression among youth who happened to lack parental supervision. Whether it's described as vandalism, "ghetto expression" or "urban calligraphy," graffiti culture has spread to nearly every major city in the United States. 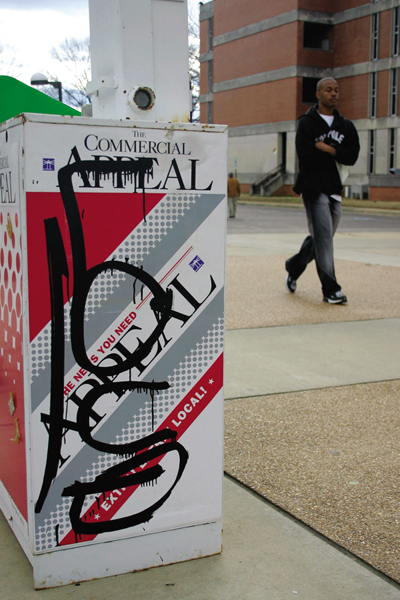 The graffiti around The University of Memphis community takes many forms, from illegible scribbling on the side of apartment complexes, to large, professionally painted murals on the sides of local businesses. 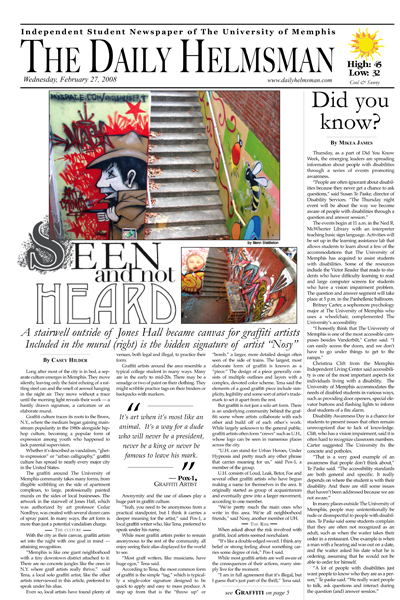 The artwork in the stairwell of Jones Hall, which was authorized by art professor Cedar Nordbye, was created with several dozen cans of spray paint. In many ways, the art form is more than just a potential vandalism charge. With the city as their canvas, graffiti artists set into the night with one goal in mind -- attaining recognition. "Memphis is like one giant neighborhood with a tiny downtown district attached to it. There are no concrete jungles like the ones in N.Y. where graff artists really thrive," said Tena, a local solo graffiti artist, like the other artists interviewed in this article, preferred to speak under his alias. Even so, local artists have found plenty of venues, both legal and illegal, to practice their form. 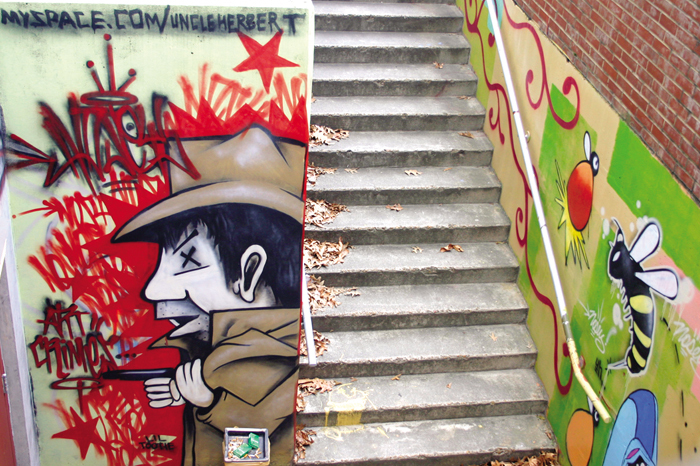 Graffiti artists around the area resemble a typical college student in many ways. Many are in the early to mid-20s. There may be a smudge or two of paint on their clothing. They might scribble practice tags on their binders or backpacks with markers. Anonymity and the use of aliases play a huge part in graffiti culture. "Yeah, you need to be anonymous from a practical standpoint, but I think it carries a deeper meaning for the artist," said Pox-1, a local graffiti writer who, like Tena, preferred to speak under his name. While most graffiti artists prefer to remain anonymous to the rest of the community, all enjoy seeing their alias displayed for the world to see. "Most graff writers, like musicians, have huge egos," Tena said. According to Tena, the most common form of graffiti is the simple "tag," which is typically a single-color signature designed to be quick to apply and easy to mass produce. A step up from that is the "throw up" or "bomb," a larger, more detailed design often seen of the side of trains. The largest, most elaborate form of graffiti is known as a "piece." The design of a piece generally consists of multiple outlines and layers with a complex, devoted color scheme. Tena said the elements of a good graffiti piece include simplicity, legibility, and some sort of artist's trademark to set it apart from the rest. But graffiti is not just a solo art form. There is an underlying community behind the graffiti scene where artists collaborate with each other and build off of each other's work. While largely unknown to the general public, graffiti artists often form "crews" such as U.H., whose logo can be seen in numerous places across the city. "U.H. can stand for Urban Heroes, Under Hypnosis and pretty much any other phrase that carries meaning for us," said Pox-1, a member of the group. U.H. consists of Loud, Leak, Betor, Foe and several other graffiti artists who have begun making a name for themselves in the area. It originally started as group of acquaintances and eventually grew into a larger movement, according to one member. "We're pretty much the main ones who write in this area. We're all neighborhood friends," said Nosy, another member of UH. When asked about the risk involved with graffiti, local artists seemed nonchalant. "It's like a double-edged sword. I think any belief or strong feeling about something carries some degree of risk," Pox-1 said. While most graffiti artists are well aware of the consequences of their actions, many simply live for the moment. "I am in full agreement that it's illegal, but I guess that's just part of the thrill," Tena said. Pox-1 and Tena romanticized their art to some degree, comparing their actions to different anonymous occupations such as a superhero or a ninja. Pox-1 refered to graffiti as art at its most primal, something that traces back to early man writing on cave walls. Others view graffiti with a more casual, laid-back approach. "Graffiti is basically like a game. You know, you make an alias for yourself and see how far you can take it," Nosy said. But due to the nature of graffiti and the property damage involved, graffiti artists are often placed at odds with local authority figures. Ernest Dobbins, the newly appointed director of Community Enhancement for the city of Memphis, works closely with local churches, schools and police to organize efforts to clean up graffiti in the city. Dobbins' organization also tends to vacant lots, abandoned houses and other areas in the city. Dobbins works with the Rev. Dwight Montgomery of the Annesdale-Cherokee Missionary Baptist Church on a regular basis to get together groups of volunteers to assist in the cleanup and raise donations for supplies. The church holds monthly meetings where church members collaborate with each other to locate areas where illegal graffiti is prevalent. Most of the cleanup efforts in the city are coordinated by neighborhood watch organizations, while some are organized by Montgomery and others are handled by the Memphis Beautiful Commission. The church then sends out volunteers who use various methods to remove the paint from the walls. Some of the methods utilized by church volunteers include repainting walls, chemical sprays and wipes specially formulated to remove paint from walls, and a power sprayer that uses a high pressure stream of water to remove graffiti. Graffiti removal for city property such as interstate signs and school buildings is handled with tax revenue. Private business owners whose buildings are defaced must often pay for the cleanup. "A lot of the graffiti itself is on private property, where the owner of the tagged property typically has to pay the cost," Dobbins said. Many people associate graffiti as a tool that gangs use to mark their territory, which has led to a negative perception of graffiti as an art form. But, according to Nosy, most experienced writers look down on gang graffiti. "Most true writers have an unwritten law that you don't do churches, schools or houses. And that's where you usually see that stuff. We try to stick to areas no one cares about," he said. Condemned warehouses, abandoned buildings, and especially train yards all are considered fair game, according to Tena. Graffiti artists nationwide have grown to accept this code of ethics into their culture and make no exceptions based on region. Some artists acknowledge gang graffiti as inferior art or even destruction of property, but others have grown to accept it as the "black sheep" of the graffiti family. "Some stuff is definitely more artistic than others. I compare it with how you have gangster rap in the hip-hop world. It may not be as nice or as pretty, but it still sends a message to the rest of the world," Pox-1 said. Richard Janikowski, director of the Center for Community Criminology and Research, said there are some connections between certain types of graffiti and gangs. "There's a very specific type for gangs," Janikowski said. "The phenomenon is very real, but it is not all graffiti." Janikowski said that indicators of gang graffiti involve tags which claim a certain area or "turf," "RIPs," which honor fallen gang members, and other messages which can be interpreted to intimidate community members or convey messages to other gang members. Janikowski said that the intention of gang graffiti is not to gain fame for an unknown artist, but to cause fear. "This type of graffiti communicates a message of who is in charge -- the gang or the community," he said. Janikowski said local police often take pictures and keep records of different types of graffiti to determine which types are showing up in which areas and if the graffiti is gang-related. Janikowski also mentioned that local police have begun a gang assessment effort, which compiles data from different police and sheriff reports in order to determine the nature and sociodemographic of the gangs. 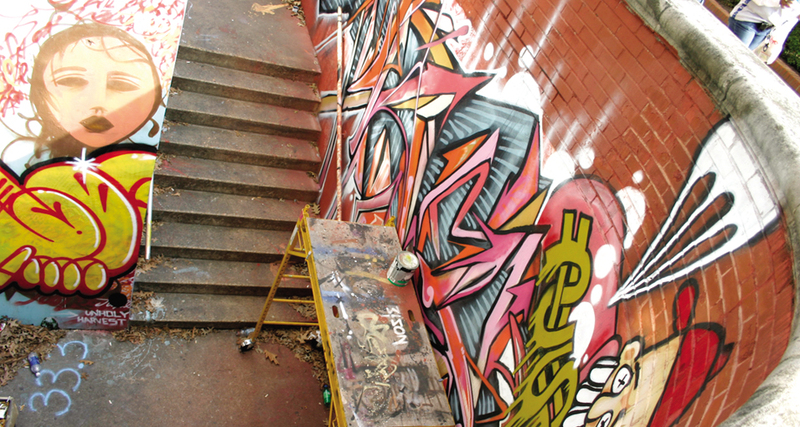 Despite their renegade associations, many graffiti artists turn their work into a form of profit or recreation by doing commission pieces for local business. Nosy has done commissioned work for Whatever, a gift shop located on Southern Avenue that incorporated an Alice in Wonderland theme into an outdoor mural, as well as Umai, a restaurant on Madison Avenue in midtown. Nosy also worked alongside Foe on a piece for Getwell Southern Machine Shop, which features a large caricature of Tony the Tiger on the outside of the main garage. Some of the time, an artist will go without payment and simply seize the opportunity to be given a blank canvas and some free cans of paint, according to Pox-1. This past fall, The U of M recognized graffiti as a legitimate art form and invited artists from around the country to come and display their work on the wall surrounding the construction of the new University Center. The novelty soon wore off, though, and The University eventually covered the art with a coat of gray paint. But for some artists, the most important work will still be done on low frequencies under the cover of darkness. "It's a common man's art form," Pox-1 said. "The rest of my life I might not get anywhere else. But if anyone else ever comes to this place, I can write on this wall, I can mark up this table, I can chalk up this concrete that I was here and at least someone will know I exist."